Summary: Holly Hobbie (yes, children of the 1970’s, that Holly Hobbie) stays close to the original version of this tale. In an author’s note, she explains how she grew up listening to a recording of the Great Gildersleeve reading the story and imagined pictures to go with it. Her illustrations portray blonde Germanic-looking children, a pointy-nosed-and- chinned witch, and a classic gingerbread cottage. Shadows loom in many of the illustrations until the final page when the children and their father are reunited. 32 pages; ages 3-6. Pros: The watercolor illustrations are beautiful and will make this classic fairy tale accessible to a new generation. 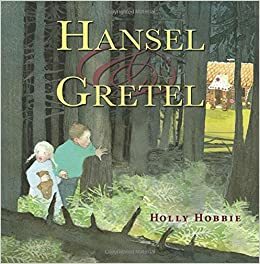 Cons: Some of the details of the fairy tale were left out; I always liked how Hansel tricked the witch into thinking a chicken bone was his finger, but that was excluded from this retelling.